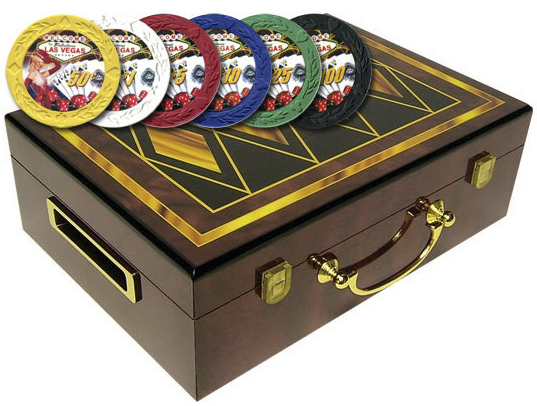 Here is our great deal on an elegant Hi-Gloss Wooden 500 Chip Poker Case item 96-0512 with 500 7.5 gram Clay Composite Showgirl Poker Chips. This is the finest type case we offer. The entire interior of the case is fully lined with green suede. This stylish designed case is constructed of solid hardwoods and lacquered to a high gloss finish. Our 7.5 Gram Showgirl Poker Chips item 90-52 are a great mid-weight poker chip. They feature a wreath pattern engraved around the rim with card suits in-between. The center of each chip has the chip denomination along with a showgirl, dice, cards, and the famous Las Vegas sign.